"The most important person in my life"
I have a boy friend now, and I think he is the most important person in my life. I met him in the Internet. I have corresponded with for 1 and half years. Now I am living with him and he helped me so much for a living in NY. I came in NY on February 7 of this year. As he has been lived this place, I learned how to take a subway & bus, the manner when I eat in a restaurant, etc., from him. These thing were somehow different from my own country. Even he came the college with me and talked with Ms. Doreen Storic when I have a trouble for enroll the college. As he is much older than me, he knows how to solve these problems. Now my life will start to have a brilliant future with him. I would like to tell you about my native country, Japan. First, my country is located in East Asia. Japan is a small island. Our neighbors are China and Korea. Our country's culture and religion came from those countries. After the World War II, our country had successful economic growth. We were forced into an industrial production after the war. But I would like you to see the other side of Japan, not like the modern city of Tokyo. There are still a lot of beautiful views in our country, because our country is surrounded by the sea and a lot of mountains. For example, Miyajima is a famous temple that is located in the sea. It is so mysterious, we can cross on the beach there in the morning, but we have to walk on the long bridge to reach to the temple in the afternoon. Everybody has something that he or she is proud of himself or herself. In my case, I experienced that I gave the birth of a baby. I am proud of that. For women, it is natural to be pregnant and to have a delivery. However, it was a more special event for me. On November 10 of 2001, I went to the hospital with my husband because the water inside me broke out in the morning. I did not feel any pain at all in that moment, so I was not in a hurry to go to the hospital. Before I went to the hospital, I went to a dentist with my husband. It was not I, but my husband had an appointment with a doctor. Then we went to the hospital in the afternoon. First I explained to a doctor what happened with me in the morning. Then she checked up all of my body. She asked me to sign my signature on some document, so I did. After I talked with her, the staff brought a bed. I laid down on the bed. It was about three o'clock. Then staff put some tube in my vein. My husband came into the room; he found that the two bottles were hanging. He asked to a nurse what were these bottles. The nurse answered that one bottle contains vitamin, and another is a pitocin. My husband started to complain to a doctor about giving pitocin without our permission. The pitocin is a medicine that speeds up a delivery. However, I needed to use it because the amniotic sac (bag of fluid) had broken, and labor still had not started. I was calm while I was lying down and taking medications. I was talking with my husband during that time. After a few hours, I started to have a pain suddenly. The pain came like one, two, three, four, five. Five is the peak. Then it went off. I was screaming at that moment because it was going on and on. I was screaming louder and louder, because the pain became worse and worse. The doctor came and he recommended taking some painkiller. I said that I would like to have a "spinal". He said "O.K." I moved to another private room for taking painkiller. Then another doctor explained the affect of a painkiller in good way and bad way. However, I couldn't listen to it because of the pain. Then another doctor came, she recommended to not taking painkiller because this was my first labor, so I did not know the timing of push out if I took a painkiller. I was almost dead for the pain, but she taught how to ease the pain. The key was how to breathe.When I felt the pain, I blew out the air from my mouth. When the pain disappeared, I started to breath slowly. I did all the time when the pain was peak. It seemed that I could bear it. I was struggling with this during the labor, and it was four o'clock in the morning when I heard my baby was crying. The baby was born!!! When I saw my baby was born, I forgot about the hard time and the pain. The baby was a girl. She seemed healthy. I thanked to God that I succeeded to a delivery. I also thanked my baby and my husband. I went to sleep after a delivery. I felt the happiest moment in my life on that date. An accomplishment is something that you are proud of yourself because you worked hard to overcome it, also you spent time or money to overcome it. From now, I would like to talk about what I had accomplished. When I was sixteen, I could not swim smoothly in a crawl style. When I was time to breath, I always stopped swimming. Then I stood at the point, took one deep breath, and I started swimming again. If I was continually swimming, I swallowed the water at the same time breathed. I decided to go swimming school because I wanted to swim better. I took a lesson three hours for a week. I was never absent the lesson. I trained and trained. Sometimes I swallowed the water, but I enjoyed the swimming lesson. The end of summer, I could swim much better than before I did. I learned the technique of breathing. And no more swallow the water! I felt something more special on that summer. This small success brought me a small happiness and self-confidence in my life. I remember that time, not only swimming, but I also read three books for a month. (Usually, I did not read a book.) It was a good memory in my life. 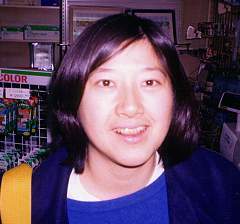 What is your opinion of Kayo Kimura? Express your opinion in the guestbook!